hailed by fans and peers alike as innovators of Goth/Death Rock and there would be no Nine Inch Nails, Marilyn Manson or countless others without them. They will be performing cuts off their masterpiece “Only Theater Of Pain” along with other standouts from their long and storied history. Playing live to support their new "Delusions of Architecture" CD/DVD in their 21st Anniversary year. Abstinence, although originally created as more of an experimental / industrial project with death rock / gothic overtones, had turned their emotional anger outward. Featuring members that have also played in Killing Joke, Ministry, Prong, Fear Factory, Emergency Broadcast Network and Operation: Mindwipe. Powertools, chains, oil drums, scrap metal and visual imagery has become an integral part in their shows, and have performed with bands such as Consolidated, Pigface and KMFDM. Versatility and taste has gained Xris a reputation leading to DJ gigs internationally at festivals all over the world: Montreal Fetish Weekend, KINK IN THE CARIBBEAN (Jamaica), FETISH FACTORY Anniversary Weekend (Ft. Lauderdale), EXOTICA IV (Detroit), NY Fetish Marathon (New York City), Skin Two (Atlanta), Torture Garden Toronto, L.A. Kink Weekend (Los Angeles), The Triton Music Festival and many many more…. Xris is also a Music Producer & Engineer as well as producer of SMack!, NYC’s longest running fetish event in New York City, and the STIMULATE monthly music event. a highly respected member of the Goth Community, Templar draws upon his years of experience and natural dark tastes in music to create the right mood with his DJ'ing and producing Deathrock, Goth and Darkwave events and spinning for many others as well, including the Wave-Gottik Treffen Festival in Leipzig, Germany. 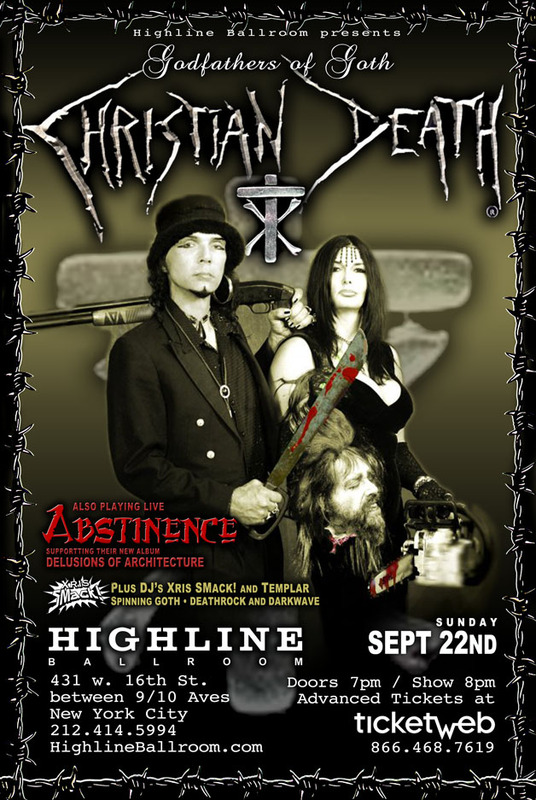 :Abstinence, Christian Death, Darkwave, Deathrock, DJ Templar, Goth, Gothic, Industrial, Xris SMack!